I know several of you have already been talking about balmy temperatures, starting seeds soon for this season's garden and posting pictures of early spring flowers poking up. 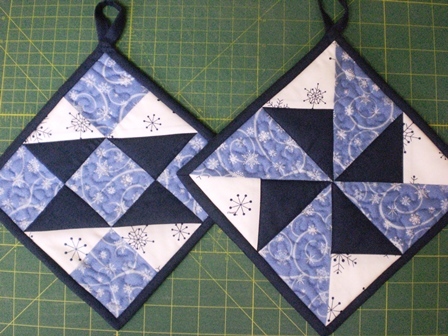 Because of that I've hesitated offering these quilted winter-themed potholders here on the blog as a giveaway because the winter season seems to be all gone and over for some of you. But, boy howdy, it's sure not the case here. Today we've gotten about 6" of new snow accompanied by lots of blowing snow and a temperature high of 8F above. It will be a long time before our winter's over. So if anybody's interested, here is the set of potholders I'm giving one of you a chance to receive. Shades of blue, from that of a winter-y blue sky to snowflakes to a deep, dark navy which is sometimes the color of our night if there's no moonlight for reflection on the snow. If you're in a part of the country that is already into early spring, you could stash these away until next winter. Just let me know in the comments section if you're interested in having your name put in the hat (it may be one with ear flappers in honor of our cold weather). I'll draw a winner this coming Sunday night, the 10th, right after I shut off my computer at 9 p.m. Be sure to get your entry in before that cut-off time, and I'll post the winner Monday morning. Good luck to all of you who might be interested in receiving a reminder of what your winter was . . . or still is! P.S. I just took this picture of a corner of our living room windows. The bottom of the windows are about 5' off the ground outside. I would love to have these potholders and they would fit right in with our weather here in the Pacific Northwest. We're expecting another snowstorm tomorrow night and last night's low was -3 with the windchill. Here in the Pacific NW we're waiting for Snowmageddon to arrive tomorrow night. Grocery store was packed. Lots of other people like me. haha The potholders are beautiful. I'd love to be part of the drawing. Thanks, and have a safe weekend! I love blue AND winter, so count me in! And like StrictlyMystic said, we're supposed to get an unusual dose of winter coming up; I heard someone say 8" in the grocery store! They are beautiful! I love your talented quilting and your blog. Count me in! Count me in too! Always nice to get new potholders. Thanks for the chance to win. They sure are beautiful. We must have gotten a foot of snow here in central MN. It took my husband an hour and a half to clear our mile long driveway and front of our house this morning. And another 45 minutes to clean it up again this afternoon. Count me in as well! They are so pretty. I could use a touch of winter in warm Texas. I love these! And as it's currently 24 below, deco still winter here! In true Nor Cal fashion we are heading into another week of snow and rain and snow. My sister is headed up for the weekend so it will be a treat for her as she lives in Fresno . Which usually has snow on the ground of some sort every 10 years or so. Planning a weekend of hanging in and just doing what we can or can’t do. If we need a day out and can’t go up to Mt Shasta for lunch at Lily’s we will go down to Chico. Goatldi I'd like that Sweet Potato Chili recipe! Lovely potholders, and I am sure the winner will appreciate receiving them. I had an urge to have a dig up in the courtyard to make a small flower bed, so I suppose that I am having spring nibble at me as well. Hope your weather treats you kindly. Would love to own your quilted potholders. They’re lovely. Please include me in the drawing, please and thanks! Oh my, spring certainly doesn't seem to be anywhere near your neighborhood. We just finished a couple of days in the 70s (almost seemed too hot!) but are taking another, more seasonal dip now. "If anybody's interested" LOL. Mama Pea, who wouldn't be interested in a pair of your potholders! I already have some so it would be a bit selfish to want more, but they are a treat. Count me in. Winter has not left. We went from almost 60 degrees last night to a windchill of 4 this morning. The wind is terrible. Thankfully, no snow right now though. I'm hibernating today. I would love to be in the drawing for your wonderful potholders. In my little sheltered part of Scotland we haven't actually had any snow this winter yet. Oh my gosh, my potholders feel so popular!! I've entered all your names. This is going to be a fun drawing! Oh gosh! I was just looking at my poor, abused pot holders and thinking I needed to replace them. I would love a chance to win your potholders. You do such beautiful work. I don’t have a Google account. My name is Barbara. Amazing potholders, I love the blue design. Thanks for sharing. This weather is crazy! It keeps yo-yo-ing up and down. 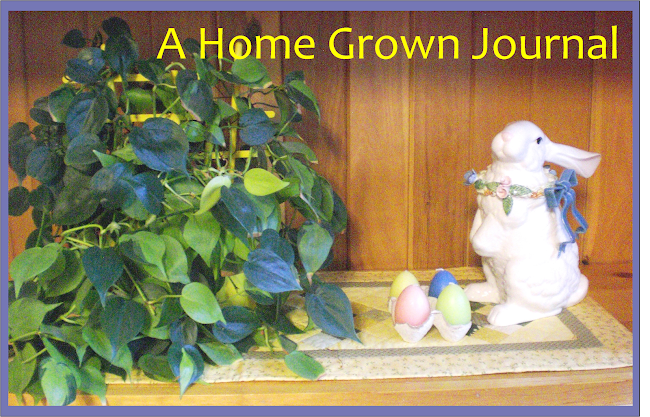 I am going to order my seeds this week but it will be quite a while before it’s planting time. YOu froze big snow balls, and will send them, in freeze safe containers, to who ever wins the Give Away!!!!!! OK, I'll get off my *wise-arse horse* and read your post. I most certainly would be interested in winning your handiwork!!!!!!!!! I'd love to have a "piece of Mama Pea" in my kitchen!!!!!!! And of course, our winter is not over here, yet either!!!! Grab the "The Cozy Life" book and snuggle in with it. Toss my name in the hat! We had downpours yesterday, last night and this morning. A cold front will be barreling through this afternoon. Wheehaw! We've had snow flurries here in Central Texas so winter isn't over here either. Please put my name in for the drawing for the pot holders, they're beautiful!!! To the most recent seven commenters, your names are entered! To my "wise-arse horse" giggly commenter, whether you win the drawing or not, I am sending you a box packed full of big, ol' snowballs!! I looked it up, on Amazon. And found that I could get the Kindle Edition, for 99 cents today. So I got it!!! Thank you! I am loving all these type of books and blogs and etc. P.S. I just "declutered" the downstairs bathroom drawer! Which has been 'bugging' me for ages! I did it! Now it is so neat and delightful looking. I would love to be included in your giveaway. I love quilted items! I hope to learn to quilt now I am retired. Would love to be counted in your give-away. Blues my favorite color. They are so pretty. Good luck to everyone!! We are getting a bit of a freeze here too but not nearly as cold as you are getting. I'd jump into your giveaway but it's probably too expensive to ship them to Canada if I won so I'll just admire them and congratulate the winner. The most recent four of you are counted in, too! I love winter and snow. Sadly we have not had any lasting snow this season although we've had temps below zero!. I just stumbled on your lovely blog today. I plan to read your back posts tonight and would love to be included in the give away chance. I'd love a chance to win those! I always use a lot of blue in the winter after the holidays and we have snow on the way interestingly enough! Wow, these are gorgeous! I would love to be in the draw. I will put them aside for our winter which happens mid-year (I am happy to pay the extra postage too). I really enjoy seeing what you are all up to in the opposite seasons to us. It is a balmy 32 degrees Celsius here in Australia. Please look after yourself in your freezing weather! Love, Love, Love those potholders and would love to win them. It's still winter here in Kansas too and will be for awhile. The most recent five commenters have been added to the drawing. What fun to hear of the weather right now in so many different places. Hi there. Yes, please throw my name in the hat. I would love to win your beautiful potholders. Thanks. It's so cozy there! 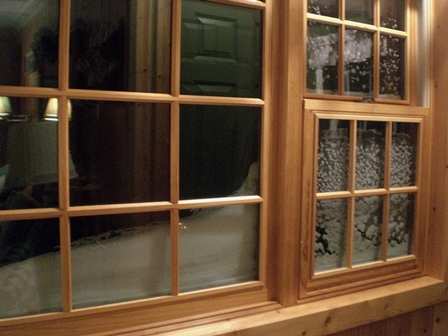 I just have so many good memories of hunkering down during storms in the winter. I know you're probably tired of it all but trust me...winter was a respite from gardening, canning and harvesting and down here there's not much of a respite in between the seasons. Just a 'heads up' there are 'trolls' on the internet that look for words like 'free' or 'giveaway' and want the items to turn around and sell so if you want it to be just for your 'blog friends' and not strangers that 'troll' the internet then you might want to leave those words out. I did not know this until I watched Priscilla and Chelsea's podcast and they always mention it as they have items for 'you know what' each week! LOL! I love your potholders and they remind me of the winter I am missing. Stay warm and safe and cozy and enjoy your knitting! P.S. We're supposed to get freezing rain tonight....I'd rather have snow! I would love those potholders! Here in Indiana, the snow is pretty much gone but the ice and high, cold wind remains. I am so tired of breaking ice in the livestock water troughs! I just ordered seeds yesterday; that was me making a wish for spring. I would love to win the hand made potholders. Your handiwork is beautiful! Thanks for sharing your talents with us. Latest four commenters' names in the hat! Hi, I just found your blog via Vera's. We are very much like you, no planting or greenery popping up here. Today is -25C and we haven't been above -15C for the last two weeks and no end in sight. What makes it worse is the windchill which is bringing it down to -45C!! Fortunately we haven't had a huge dump of snow for a few weeks, just a couple of inches every few days. I love the potholders and would love to be included in your draw. I have a very similar small table topper that I put on my coffee table over Christmas. I was lucky enough to win that on a Norwegian blog several years ago. I'm off to have a look around your blog, stay warm!! 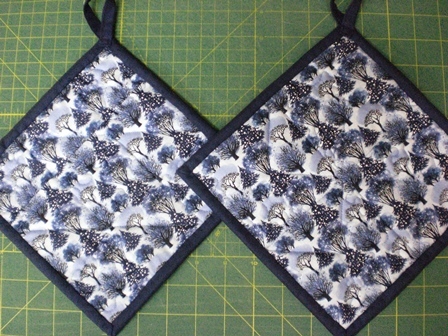 Lovely pot holders! I feel certain that the winner will enjoy them. I'm slow on the draw. If entry time is still available, please add my name to your give-away. If not, I totally understand. That's too much snow!!! I know you're staying nice and warm. How are your birds doing with the weather? Janice and The Liberty Belle, your names went into the hat last night before cut- off time. Sandy, yes, you popped in here after the cut-off time. Sorry, m'dear!